Beta-thalassemia is an autosomal hematological disorder that is the result of genetically deficient synthesis of beta-globin chains of hemoglobin. Beta-thalassemia is one of the most common single-gene disorders with >400,000 new borns affected per year worldwide. Patients present with severe microcytic hypochromic anemia, massive hepatosplenomegaly, and bony deformities. Infection is a major complication and the leading cause of death in thalassemia out of which Pulmonary disease was the most common cause of mortality. In this report we aimed to discuss our experience with a case of beta-thalassemia major with massive splenomegaly & superimposed pneumonia in a child presenting for splenectomy. β-Thalassemia is an autosomal hematological disorder that is the result of genetically deficient synthesis of β-globin chains of hemoglobin . β-Thalassemia is one of the most common single-gene disorders, with more than 400 000 newborns being affected per year worldwide . Patients present with severe microcytic hypochromic anemia, massive hepatosplenomegaly, and bony deformities. Infection is a major complication and the leading cause of death (12.8-46%) in thalassemia, of which pulmonary disease was the most common cause of mortality accounting for 28% of all deaths . Responsible organisms were Escherichia More Details coli (26%), Klebsiella pneumoniae (23%), and Salmonella More Details spp. (15%) and Streptococcus pneumoniae (13%) . In our search of the literature we did not come across any study on the anesthetic management of β-thalassemia major, with massive splenomegaly and superimposed pneumonia, in a child presenting for splenectomy and we are therefore reporting it here. 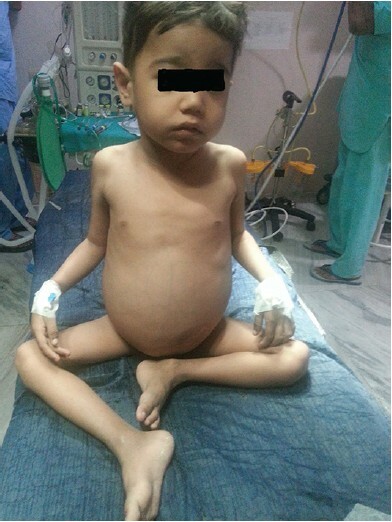 A 5-year-old male child, a known case of β-thalassemia with massive splenomegaly and pneumonia presented to us for splenectomy. He was diagnosed with β-thalassemia major at the age of 6 months. His blood transfusion requirements increased gradually. He received bleeding time (BT) every 2 months until the age of 2 years, thereafter every month, for the past 6 months every 15 days, and for the past 3 months it stepped up to once every week. He presented to us with an enlarged abdomen. On examination, his heart rate was found to be 160 beats/min, blood pressure was 100/70 mmHg, and respiratory rate (RR) was 40/min. He was having difficulty in breathing, which increased on lying down. Pallor was present. 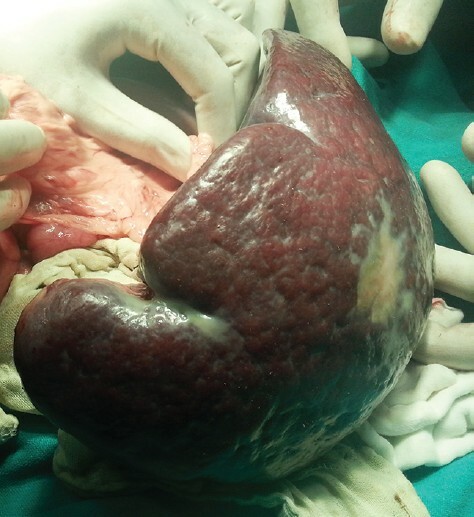 Massive splenomegaly (measuring 27 cm toward the long axis) and hepatomegaly (liver span 9.5 cm, upper border extending upto fifth left intercostal space) were present. His Hb was 8 g%, white blood cell count was 13 000 per/mm 3 , and platelet count was 40 000. His prothrombin time was 20 s (control 15 s), activated partial thromboplastin time was 60 s (control 22 s), and international normalized ratio was 1.33. Liver function test was near normal, except for aspartate aminotransferase, alanine aminotransferase, and alkaline phosphatase, which were raised. Kidney function tests (KFT) and serum electrolyte levels were within normal limits. Radiological findings suggested pneumonia. He was on envas (1.25 mg twice daily), crocin, and antibiotic therapy. He was shifted to the operation theatre, and a monitor was attached. His heart rate was 120 beats/min, blood pressure was 98/62 mmHg, and SpO 2 was 65% on air in the lying down position. ECG was within normal limits. Preoxygenation was started at the rate of 5 l/min of O 2 and saturation came up to 80%. Premedication was carried out with glycopyrrolate (0.1 mg) midazolam (0.5 mg), and fentanyl (25 μg). Induction was performed by the administration of propofol (50 mg) and ketamine (25 mg). We were able to ventilate the patient, for which succinylcholine (25 mg) was administered. On attempting laryngoscopy with Macintosh blade no. 2, the patient's saturation level fell down to 60% and he became dusky and cyanosed as ventilatory efforts did not prove fruitful. A second attempt was made with Miller's blade, which was again unsuccessful and the patient again became desaturated. We started ventilating him manually on the Modified Jackson-rees Circuit and raised his head by placing a pillow underneath, which improved his condition. Intubation was again attempted in that 'semi-sitting' position to unload the diaphragm and, after repeating succinylcholine (20 mg), intubation was performed successfully with a 5-mm uncuffed endotracheal tube. Anesthesia was maintained with O 2 , isoflurane, and atracurium in intermittent doses of 2.5 mg. By this time, saturation improved to 86% but the airway pressure was quite high (32 cmH 2 O). After the spleen was removed, saturation came up to 93%. Airway pressure also gradually settled down to 21 cmH 2 O. Dexamethasone (4 mg) was administered intraoperatively to prevent postintubation croup and glottic edema. Estimated blood loss was 300 ml. The patient was given four platelet concentrates intraoperatively and fluid replacement was carried out with 300 ml Ringer lactate and 150 ml of blood. Urine output was 110 ml at the end of surgery. Anamol suppository (170 mg) was administered for postoperative pain relief. Anesthesia was reversed with 1 mg neostigmine and 0.1 mg glycopyrrolate, and thereafter the patient was extubated. The patient was shifted to the recovery room and monitored for an hour; during this period he maintained a saturation of 96% on 2 l/min of oxygen. Rest of the patient's vitals were stable. Thereafter, he was shifted to the pediatric ICU ([Figure 1] and [Figure 2]). In severe cases such as thalassemia major, presentations such as pallor, icterus, and enlarged abdomen are common. Also, bony defects such as frontal bossing, which are prominent facial bones, occur due to ineffective erythropoiesis, with thrombocytopenia making them vulnerable to infections. Patients present with severe microcytic hypochromic anemia , massive hepatosplenomegaly, and bony deformities. They need frequent blood transfusions and have to face the problem of iron overload . Pneumonia is characterized by inflammation of alveoli and terminal airspaces by invasion of an infectious agent. Plasma leakage, surfactant loss, and consolidation occur. This inflammation cascade and invading agent tend to increase airway smooth muscle tone and increase secretions, leading to high airway resistance, obstruction, air trapping, and dead space formation . In this case, the major challenge was the airway resistance as the patient was getting desaturated in the supine position, which was due to the massively enlarged abdomen pressing against the diaphragm, resulting in a V-Q mismatch worsened by pneumonia. Performing intubation in the 'semi-sitting' position helped our cause by improving the saturation and buying us sufficient time for scopy and intubation. The Modified Jackson-rees Circuit was chosen to ventilate the patient in view of the increased airway resistance that we were dealing with  and for providing the advantage of manual ventilation in assessing lung compliance and exhalation. Patient's breathing rate was maintained at 12 breaths/min and inspiratory pressure was kept low to provide adequate time for exhalation, which was important in patients with increased airway resistance . For induction, propofol, which is superior to others in limiting the increase in airway resistance [10,11], and ketamine , whose sympathomimetic effects on bronchial smooth muscles help in decreasing airway resistance, were used. Besides, their combination together with fentanyl provides a better hemodynamic stability . Ketamine increases secretions, therefore premedication with an antisialagogue was useful. Isoflurane was the agent of choice because of hepatic involvement . Our anesthetic management was also complicated by anemia (decreased oxygen carrying capacity), thrombocytopenia, and altered coagulation profile (risk of bleeding). This was taken care of by the administration of four platelet concentrates given intraoperatively and by proper replacement therapy with fluids and blood transfusion. Strict input-output charting was performed. Improvement in saturation after removal of the spleen proved its restrictive effect on lung physiology. Reversal was uneventful. In the postoperative period, the patient developed fever, which was managed by administration of an intravenous infusion of paracetamol. The patient was shifted to the pediatric ICU for further management. He was continued on antibiotics for the treatment of pneumonia. Saturation remained 96% (on air) after surgery. He was discharged 10 days later. We have followed up the patient even after that. His father informed us that now he has started attending school on a daily basis, has become more active in his routine activities, and now he receives transfusions once every month. Successful anesthetic outcome of a patient with β-thalassemia major, hepatosplenomegaly, and pneumonia is possible with a properly planned airway management procedure beginning with preoxygenation until extubation and making the choice of agents accordingly. Together with this, meticulous fluid management and maintaining hemodynamic stability have a key role in the outcome. Lahiry P, Al-Attar SA, Hegele RA. Understanding beta-thalassemia with focus on the Indian subcontinent and the Middle East. Open Hematol J 2008; 2:5-13. Angastiniotis M, Modell B. Global epidemiology of hemoglobin disorders. Ann N Y Acad Sci 1998; 850:251-269. Steinberg MH, Barton F, Castro O, Pegelow CH, Ballas SK, Kutlar A, et al. Effect of hydroxyurea on mortality and morbidity in adult sickle cell anemia: risks and benefits up to 9 years of treatment. JAMA 2003; 289:1645-1651. Wanachiwanawin W. Infections in E-beta thalassemia [review]. J Pediatr Hematol Oncol2000; 22:581-587. Ali S, Khan FA. Anaesthetic management of two patients with-thalassaemia intermedia. J Pak Med Assoc 2010; 60:582-584. Gupta N, et al. Anaesthetic management of a patient with Eisenmenger syndrome and β-thalassemia major for splenectomy. Indian J Anaesth 2011; 55:187-189. Remington JS, Klein JO. Barnett JH. Infectious diseases of the fetus and newborn infant. 6 th ed. Philadelphia, PA: Elsevier Saunders Co; 2006. 297-317. Martin DG, Kong KL, Lewis GT. Resistance to airflow in anaesthetic breathing systems. Br J Anaesth 1989; 62:456-461. Wu RS, Wu KC, Sum DC, Bishop MJ. Comparative effects of thiopentone and propofol on respiratory resistance after tracheal intubation. Br J Anaesth 1996; 77:735-738. Eames WO, Rooke GA, Wu RS, Bishop MJ. Comparison of the effects of etomidate, propofol, and thiopental on respiratory resistance after tracheal intubation. Anesthesiology 1996; 84:1307-1311. Huber FC, Reves JG, Gutierrez J, et al. Ketamine: its effect on airways resistance in man. South Med J 1972; 65:1176-1180. Hayakawa-Fujii Y, Takada M, Ohta S, Dohi S. Hemodynamic stability during induction of anesthesia and tracheal intubation with propofol plus fentanyl, ketamine, and fentanyl-ketamine. J Anesth 2001; 15:191-196. Green DW, Ashley EM. The choice of inhalation anaesthetic for major abdominal surgery in children with liver disease. Paediatr Anaesth 2002; 12:665-673.